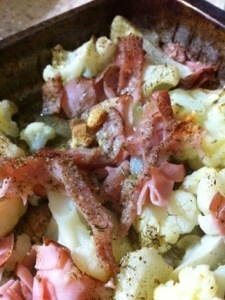 Parmesan & ham baked cauliflower…Lazy lady’s paleo dinner. Par boil quarter of a cauliflower. Chuck it in a tray with some chopped ham, a knob of butter, a sprinkle of Parmesan and dried herbs. Bake for 10 minutes to crisp the ham slightly and crunchify the Parmesan, voila! Dinner in 11 minutes! Next time I’m going to try and find something that will make it more creamy…maybe a coconut & chicken version. Mmm.